After the fashion of the mechanically reproduced prints popular during the 19th century, reproductions of sculptures abundantly adorned middle-class interiors. Reproductions were produced to suit all budgets (in bronze, patinated plaster, Sèvres bisque porcelain, carton-pierre, zinc plated in copper via galvanoplasty, etc. ), as well as all tastes. Miniatures in different sizes were also made available. The boom in the production of bronzes during the 19th century was made possible thanks to three innovations. Firstly, the device invented by Achille Collas, which allowed its users to mechanically reduce or increase the scale of models. Achille Collas was awarded a Grand Médaille d'Honneur for his invention at the 1855 Exposition Universelle of Paris. Secondly, progress made in the sand casting technique, which allowed for the mass reproduction of a given work. Thirdly, the establishment of contracts between sculptors and foundries, which protected the creators’ ownership rights and ensured them an income. The manufacturers’ success depended not only upon technical advances, but also their marketing talents and their discernment in the selection of artists and oeuvres likely to satisfy the dominant academic tastes of their middle-class clientele. No less than 153 manufacturers were present at the Exposition Universelle of 1889. Among this multitude, a few names stood out, with their boutiques resembling art galleries: Barbedienne, Susse Frères, Thiébaud Frères, Siot Decaux-Ville and Hébrard. 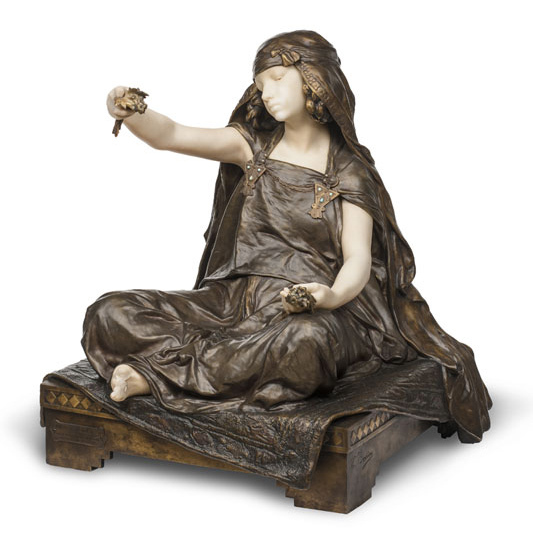 Bronze reproductions were a hallmark of the 19th century, embodying the century’s dream: the marriage of art and industry, backed by the French state both for economic reasons and as a means of supporting France's image as a nation of the arts. 19th-century sculpture was marked by the manufacture of reduced scale reproductions. In the 1870s and 1880s, contemporary works became increasingly common in the manufacturers’ catalogues. Numerous artists created works destined specifically for industrial production. At the same time, monumental works commissioned for the public sphere, such as funereal sculptures, were added to the catalogues. This trend was illustrated, for example, by The Spinner of Bou-Saada created by Barrias for the tomb of the painter Guillaumet at the Montmartre cemetery. Among the most fashionable subjects were historical themes, female nudes tinged with eroticism and the figures of children. Sculptors did not hesitate to place their talents at the service of the decorative arts, notably in the designing of vases (Cheret, Rodin, Desbois, Dalou, etc.) and spectacular centrepieces (Frémiet and Agathon Léonard).